May I talk about volunteering without sounding like I’m trolling for kudos? 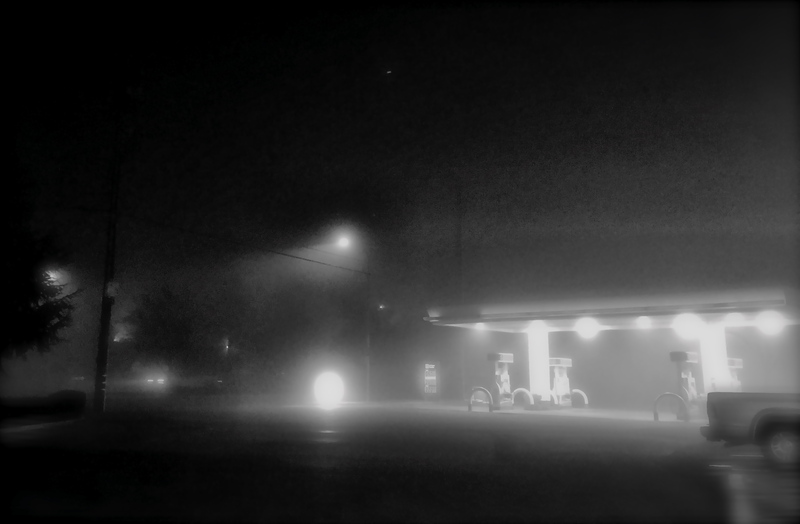 That’s the Anderson Road Shell station this very foggy morning at about 5:45. I was getting gas before heading over to the United Methodist Church–just a couple blocks away–where the Interfaith Rotating Winter Shelter is this week. I am a driver–someone who picks up guests at the shelter and takes them back to intake. Guests are homeless folks. Intake is the Quaker Friends Meetinghouse at 4th & L. In other words, in the morning, after a good night’s sleep and a couple of meals, guests are required to vacate the church (each week a different church or synagogue hosts the shelter) and return to where they registered the night before… and then to wherever they are going to hang out for the day. And I am the person who drives them there (usually there are two or three of us making three or four trips each). I take four people on each trip. If they don’t have anything to pick up at intake–strollers, large items, weapons (mostly knives, and there is a specific procedure for this), they can be taken to the downtown Jack-In-The-Box, which they are allowing this year again after disallowing it last year. Anyway, lots of driving back and forth…it would have been a bad time to run out of gas. I drive for the IRWS because it’s a regular, discreet and useful task, and I wanted to contribute some of my considerable time to something outside my day-to-day world. Mostly I wanted to get a little closer to the human part of the homeless story. I end up meeting a lot of Davis’ homeless population this way and having conversations, albeit brief. I can’t not see homelessness in Davis anymore, or anywhere, really. I feel connected to it…in a pretty small way… but it’s a big reminder, nonetheless. This is my second winter of driving and I usually do it once a week. So the day started with that. Then I took a quiche (a pretty good quiche, actually), that I had made last night, over to the high school for a teacher breakfast meeting. This is a totally different kind of volunteer gig. I signed up to be part of a large hospitality group that makes or contributes items for various teacher appreciation events. Totally unsung. It’s largely anonymous, as typically they call for items (via a general email blast), you add your name and item online (via Signup Genius), bring said item to the teacher’s lounge at the appointed time (long before any teachers show up and usually before any of the set-up people even arrive), drop off your dish, and leave. That’s it. You get an automated thank you sometime later. I think I do this one because I feel like everyone’s gotta do their part to make the whole school thing work, and I’m happy enough to be an anonymous cog in the wheel, making my occasional dish for the cause. Then I came home and spent a few hours revising the general overview document for the Compassion Tour. That was actually work work–a lot of real writing and editing. Actually had to use my brain. Shipped it off to my planning team compadres this afternoon, which was enormously satisfying. For the time being, ball’s in someone else’s court. I love that. Anyway, not singling myself out here, like I said. Everybody does stuff in the community and that’s the way it’s supposed to be. It just seemed like a good blog subject today since just about everything I spent time on seemed to be about volunteer work. Yay me.